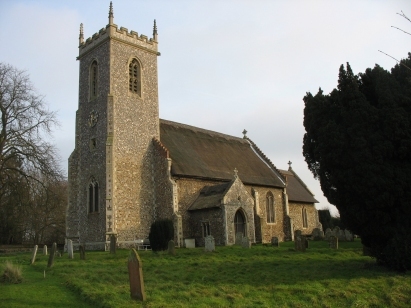 Woodbastwick parish lies in the Bure valley to the east of Wroxham and north-west of South Walsham. The northern boundary of the parish runs along a meander of the Bure enclosing a large area of carr-woodland and the nature reserve of Decoy Broad. The southern half of the parish is largely arable agriculture. Today the village is home to Woodforde's Brewery and visitor centre; a restoration of brewing in the county. 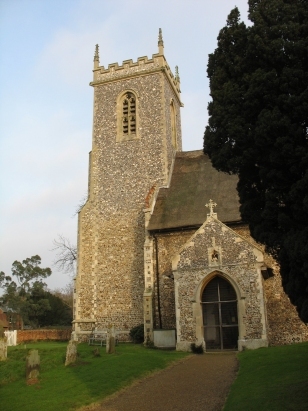 The dedication of the church to Sts Fabian & Sebastian is unique in England. The church lies at the heart of the village on the main crossroads, it was orihinally 14th century but was extensively renovated and added to the the late 1870s to give its modern image. These records were transcribed from Microfilm MF/RO340 in the collection of the Norfolk Record Office. Despite this being a relatively old filming the images were relative good and with good contrast. As the ruled register was not started until August 1813, 3 entries were added from the 1812/3 BT to complete the period. Subject to the usual proviso regarding the standard of hand-writing there should be relatively few errors in this transcript.